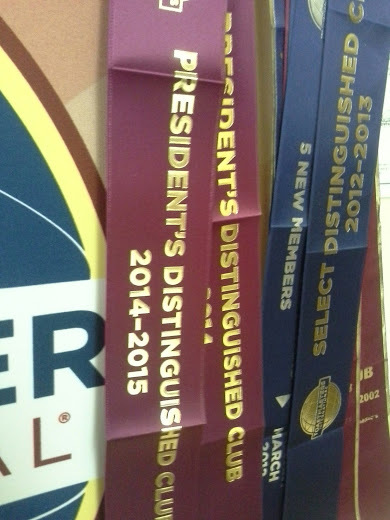 What is a Distinguished Club? In a speech by our distinguished speaker PJ R., two questions were posed regarding Toastmaster’s Distinguished Club Program. While it sounds like prestige inside the organization, the award program is really about creating the best member experience for YOU! Trained club officers are better able to serve and support our club.Goal 9 is achieved when at least four of our officers (president, vice president education, vice president membership, vice president public relations, secretary, treasurer and sergeant at arms) are trained in their responsibilities. 9) A minimum of four club officers trained during each of the two training periods. Fulfilling administrative duties, including submitting information on time, helps our club run more smoothly, which benefits members. 10) On-time payment of membership dues accompanied by the names of eight members (at least three of whom must be renewing members) for one period and on-time submission of one club officer list. The Distinguished Club Program is a way to inject energy into our club. It encourages membership and personal development. As members set and meet educational goals, they develop confidence and critical communication and leadership skills, inspiring others to do the same. The club’s focus on individual and collective achievement also helps build team spirit and club pride that is infectious and self-sustaining. Morningstars started the year brightly with a collective, continuous sense of high-lighting our club in the community. With a quick announcement: “we achieved the President’s Distinguished Club award”, we all shone with the knowledge that we can do it again, even two-fold, this year. Our website address will be changing from “wordpress” to another one soon, and this will allow more creativity and club ownership led by Weegee, our marketing master. Let’s all participate as supporting membership influence such as the 12s fan club of the Seattle Seahawks (Weegee’s reference). We all promote our club through sharing our experiences with others. This year our motto is: Speak Your Heart. Speak Your Mind. Sharon, our president, radiates this idea when she speaks. As VP of Promotion this year, I will refer to the motto at every opportunity. At the Executive meeting last Sunday held at the FUSE in Lower Gibsons, Sheila, VP of Membership was acknowledged that learning her new role will be accomplished when guiding the next new member. And we had a new member at this week’s meeting! I had a chance to chat with the new member, Wendy Morris, (my sister) after work yesterday. She was reading the Competent Communicator manual when I called her. She had just met with Sheila and was already signed up for a role this month. She is anticipating a call from Katherine, our VP of Education. We were inspired by Mike’s Ice-Breaker speech this week. He, like several others, received his Ice Breaker pin that morning. Thank you, Sharon, for reflecting how our club’s executive team works hard behind the scenes as well as speaking at meetings such as Larry, Treasurer, and Ben, Meeting Recorder. Liam, our Sergeant of Arms, has volunteered to Chair our Table Topics and Tall Tales Speech Contest on September 30th. Check out our website and blog account for more information about upcoming speaking opportunities. Soon, for example, the Gibsons Art Gallery is interested in our participation in promoting their Joni Mitchell event. Thank you all for speaking your heart, speaking your mind.